- Publisher The latest in the best selling Bible Cure series, Dr. Colbert shares insights for those struggling with Lupus, Multiple Sclerosis, and Rheumatoid Arthritis. - Publisher The latest in the best-selling Bible Cure series. Dr. Colbert shares insights for those struggling with Lupus, Multiple Sclerosis, and Rheumatoid Arthritis. 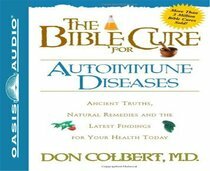 About "The Bible Cure For Autoimmune Diseases (Bible Cure Series)"
The latest in the best selling Bible Cure series, Dr. Colbert shares insights for those struggling with Lupus, Multiple Sclerosis, and Rheumatoid Arthritis. The latest in the best-selling Bible Cure series. Dr. Colbert shares insights for those struggling with Lupus, Multiple Sclerosis, and Rheumatoid Arthritis.